This deal is a very hot seller. Tuango has already sold over 1,000+ vouchers at the time of this post. With locations in Magog and all over Sherbrooke, Caffuccino offers a unique décor, a trendy atmosphere and large terraces for the summer season. Whether for a tête-à-tête, a business meeting, time with friends or simply to celebrate an special occasion, you’ll fall in love with Caffuccino. Every Caffuccino location also offers private rooms that can accommodate groups of 10 to 80 people, and are ideal for and celebrations of all kinds. 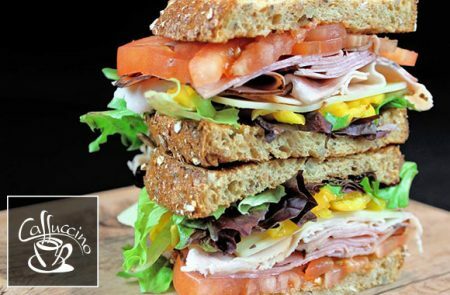 Their breakfast, lunch and dinner menus will captivate your palate with an array of specialties: waffles, European pizzas, fresh pasta, burgers, salads and a wide variety of panini sandwiches, not forgetting their famous coffee and legendary desserts. This offer is valid every nights in the 6 Caffuccino restaurants located in Sherbrooke and Magog. It can be used for meals or drinks in dining room only.